It’s almost spring, which means I’m looking for some interesting trees and plants for my garden, to add a little zest to the landscape and to fill in holes from any plants that didn’t make it through the winter. I’ve had a longstanding hole in my backyard along the fenceline that I plan to fill in this spring. 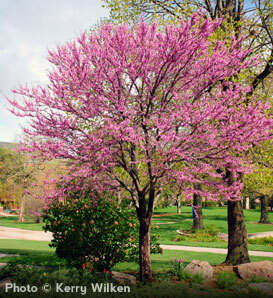 I’m going to plant two redbuds (Cercis canadensis, photo credit: Arbor Day Foundation, www.arborday.org) and look forward to their beautiful spring blooms. Why did I choose the eastern redbud? The most important reason is that it’s a species that’s native to the mid-Atlantic region where I live. As a general rule of thumb for the Chesapeake region, non-native species are species introduced to the ecosystem after the arrival of Europeans in this area (1700s), and native species are species that were here before that time. Non-native species have been introduced to ecosystems in many different ways – as plants for people’s gardens (roses), as crops (tomatoes), as possible fur producing animals (nutria), as ornamental animals for the lawns and ponds of wealthy landowners (mute swan), as misguided attempts at erosion control (kudzu), as packing material to protect fragile items (Japanese stiltgrass). Some non-natives don’t cause any problems (roses or tomatoes); they stay where they’re planted and serve the intended purpose. But some non-native species “go rogue”. When they leave the habitat in which they evolved, and enter a new habitat, they’re able to outcompete other species. This unbalanced competition causes disruptions in species interactions that have evolved over thousands of years. A great example of an invasive non-native species in the Chesapeake Bay is the snakehead fish – this top predator can really clean out a lake, leaving almost nothing in its wake. AND it has no natural predators – talk about a one-two punch for native ecosystems! That’s why we want to try to plant as many native plants in our gardens as possible. They’ve evolved to be able to handle the climate in the native area – think less water needed, fewer pesticides (they’ve evolved natural defenses), less fertilizer (they’re used to the native soils). They have also evolved to work with other native species. Many plants and insects come out of winter sleep at about the same time – the plants are ready to be pollinated, just as those pollinators wake up! What a great system! So I’ll be planting my two beautiful redbuds this weekend and enjoying them for many years to come! If you’d like to see some native species from your area, check out eNature’s listing of local species by zip code. What are you planting in your garden?